LoanMe provides working capital and fixed payback loans to small businesses with less-than-perfect credit, and offers predictable fixed payments. Quick approval and cash transfer can keep your business going in an emergency, but high interest rates may offset the benefits of fast funds. Detailed information about services can be difficult to locate on the site. 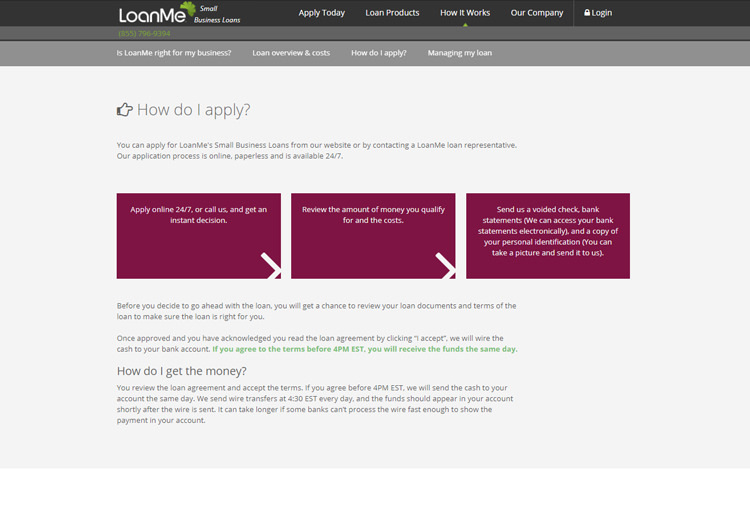 LoanMe offers quick access to up to $75,000 for businesses in operation for a minimum of 3 months. The loans can be used for covering emergency expenses or for when you have the chance to take advantage of a promising business opportunity but lack the funds for an initial investment. Cash is delivered quickly, you’ll never be delayed by a lengthy application and approval process, and loans are paid back on fixed terms. LoanMe provides an alternative for companies in need of immediate cash but lacking the solid financial foundation required by traditional lenders. They provide working capital and fixed payback loan structures for small companies and sole proprietorships to use for any purpose. You don’t have to provide a detailed business plan or explain why you need the loan. LoanMe simply asks for basic information and delivers potential loan amounts and terms based on their assessment of your ability to handle debt. The application process is straightforward, and LoanMe’s lending features make it easy for companies to qualify and receive funds. The person submitting the loan application must be at least 18 years old and have a valid ID to qualify. Since all loans from LoanMe are unsecured, no collateral is required. You can submit your application online or over the phone for your convenience. The online application option is available all day, every day to accommodate busy business owners. Application information should take approximately five minutes to submit, and turning in your application before 1 pm ET can expedite approval and transfer of funds. Through LoanMe, you gain access to “competitively priced products” and “lending criteria designed to meet your needs,” meaning that the company uses the information provided in your application to generate an offer they believe is the best fit for your business. Your ability to handle monthly payments without being overwhelmed is also considered in accordance with their responsible lending policy. Using this information, LoanMe evaluates your current and past financial state to determine eligibility before sending you the loan amounts and terms for which your business qualifies. The better your financial situation, the more favorable the terms and interest rates. Wire transfers are made at 4:30 pm ET daily, so if you agree to the terms and payment structure before 4 pm ET, the money can be wired to your account the same day. You may experience a short delay depending on the bank you use. It’s possible to check average loan terms and rates before going through the application process with LoanMe by visiting their “Current Rates” section and selecting your state. This section provides a detailed breakdown of both the working capital and fixed payback loan options at varying amounts, interest rates, and term lengths. For more detailed information pertaining specifically to your business, you can submit a partial application and view loan options without impacting your credit score or paying any fees. LoanMe only allows customers to have one loan out at a time, so you have to pay off any current loans before applying for another if you need it. It’s important to follow a consistent and responsible repayment structure because they report your payment activity to the three major credit bureaus every month. Required minimum payments are calculated during the approval process, and it’s up to you to create a budget to meet the stated deadlines. Monthly payments are calculated based on the interest rate and loan terms that LoanMe customers agree to when entering into a loan agreement. Payments may be automatically deducted from a business checking account, paid using a check or cashier’s check, or managed through an automated clearing house (ACH). Loans can be paid back early with no additional fees or penalties, and early repayment on working capital loans may save you a significant amount on interest. Making on-time payments has a positive impact on credit score and may help businesses qualify for better terms and lower interest rates on future LoanMe loans. However, a good payment history doesn’t guarantee approval for additional funding. If you have trouble making your monthly payments, LoanMe provides a phone number for you to call and discuss your options. The LoanMe website offers a short FAQ section for curious customers and provides a phone number to call for more information. Common questions are also answered throughout the site, although some information can be difficult to find and may be included only in a small footnote. If you’re looking for more general information, visit the LoanMe blog for articles relating to loans and lending. Using the “Current Rates” section, you can see a breakdown of common loan amounts and costs in your state. More specific details are available if you click on “Check Your Loan Amount” and submit a short form. 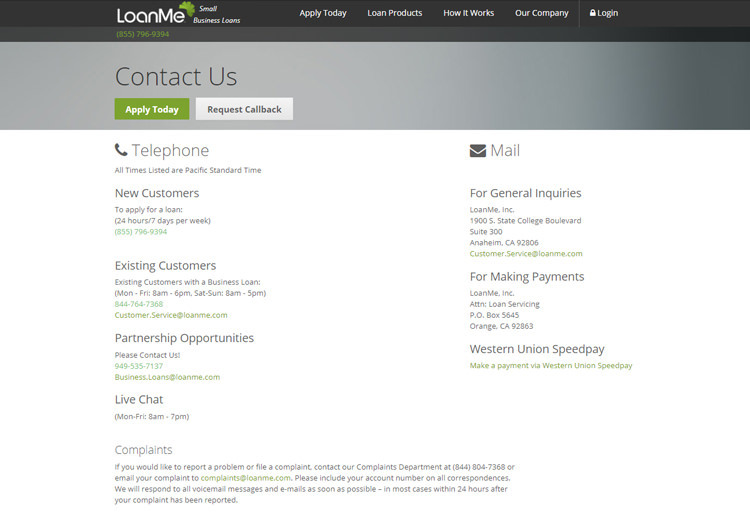 If you have any concerns or complaints, LoanMe promises “prompt and professional” responses via phone support. LoanMe provides working capital and fixed payback loans to small businesses with less-than-perfect credit or shaky financial histories. Quick approval and cash transfer can keep your business going in an emergency, but high interest rates may offset the benefits of fast funds. Detailed information about services can be difficult to locate on the site, meaning you’ll likely have to contact the company by phone to have questions answered. However, if your credit score is keeping you from getting the money you need for your business and you prefer a loan with predictable fixed payments, the LoanMe platform could be the right choice. 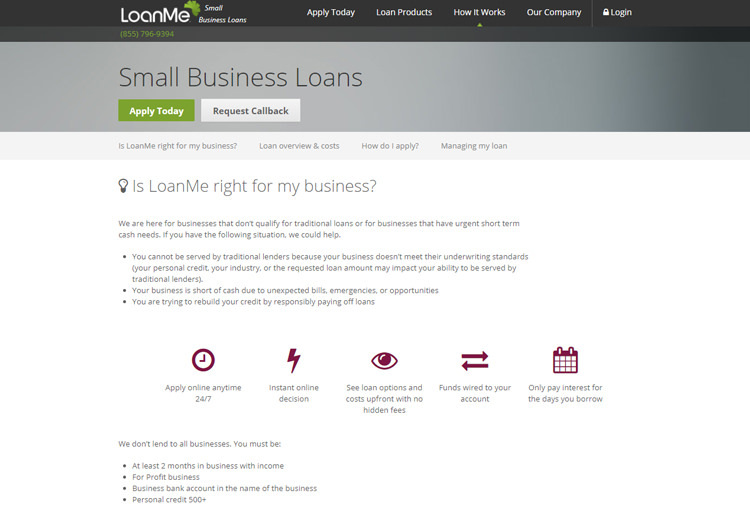 LoanMe offers both personal and business loans to individuals and companies in need of fast cash. Founded in 2013, the company aims to provide money to those who can’t qualify for or don’t have the time to go through the application process associated with traditional loans. Business loans are provided especially for small companies and sole proprietorships to help cover a variety of expenses. Through their small business division, LoanMe extends funding to for-profit companies in the form of working capital and fixed payment loans. They advertise same-day or next-day delivery of funds in amounts up to $75,000 depending on credit rating and financial history. By focusing on the total financial state of a company rather than any single factor, LoanMe seeks to provide the highest loan amounts and the best terms to each applicant.